Charlie Gilkey is is the creator of Productive Flourishing and the host of the Creative Giants podcast. He describes himself as the result of mashing up an entrepreneur, Army officer, and philosopher. In this episode, Charlie talks about mindsets, business, and the power of art. 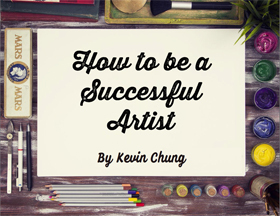 Many artists have painted themselves into a corner by calling themselves an artist. They are afraid of the fraud police that tell them they’re not good enough to be an artist. There’s a story they tell themselves about what it mean to be an artist. While it can be empowering to call yourself an artist. That label also carries a lot of weight. If you feel the heaviness of the artist title, Charlie suggest dropping it. He advocates “focus on the craft” rather than “evaluation of the craft. The challenge of the artist label is, “It’s an invitation for people to evaluate your work.” It can be hard to been seen this way, even though that is one of the reasons we create art. “We want to be seen, but we’re scared to be seen.” Often times the thought of being an artist can be unhelpful. When you feel that weight, like Atlas holding the world on his shoulders, drop the label and just create. As artists, we have this vision of what our work will look like when it’s complete. We spend hours on end trying to achieve that vision. Often times, it can prevent us from actually releasing our work. It is in these moments that you must move on. Charlie thinks that what you’ve created is “more beautiful than that perfect image that you have in your head.” That piece of art can change and inspire lives, but it can’t do that if they never see it. Perfection is unattainable. If we waited for perfection every time we create a piece of art, we would have nothing to show for it. Don’t use the excuse of unfinished work for not selling or showing your paintings to others. There’s a sacredness in allowing someone to buy a piece that you’ve poured your soul into. Be willing to let go of your art, even it doesn’t meet your standards of perfection. Artists often have trouble determining the right price for their work. According to Charlie, they are making it much harder than it needs to be. Far too often, we become too attached to our art. We think the amount we sell our work for determines our worth, but that simply is not true. Art is worth what someone is willing to pay for it. Charlie suggests looking at the art market and using it to choose your price. Go to an art fair, and see the range of prices people are willing to pay, then just pick a number. Don’t try to analyze it to death. These prices work because others are already willing to pay them. Art is hard to quantify because it’s so subjective. People buy your art based on the way it makes them feel. If you can get your art in front of people who want to buy it, they will pay you what you are worth. Just make sure you find people who are willing to pay you in kind. eventually it turned into paid offers, products, speaking, events, etc. “As a professional artist, you really have to think about how you’re going to make a sustainable go of this. Would you buy from someone you despise? & Would you buy from someone you like?